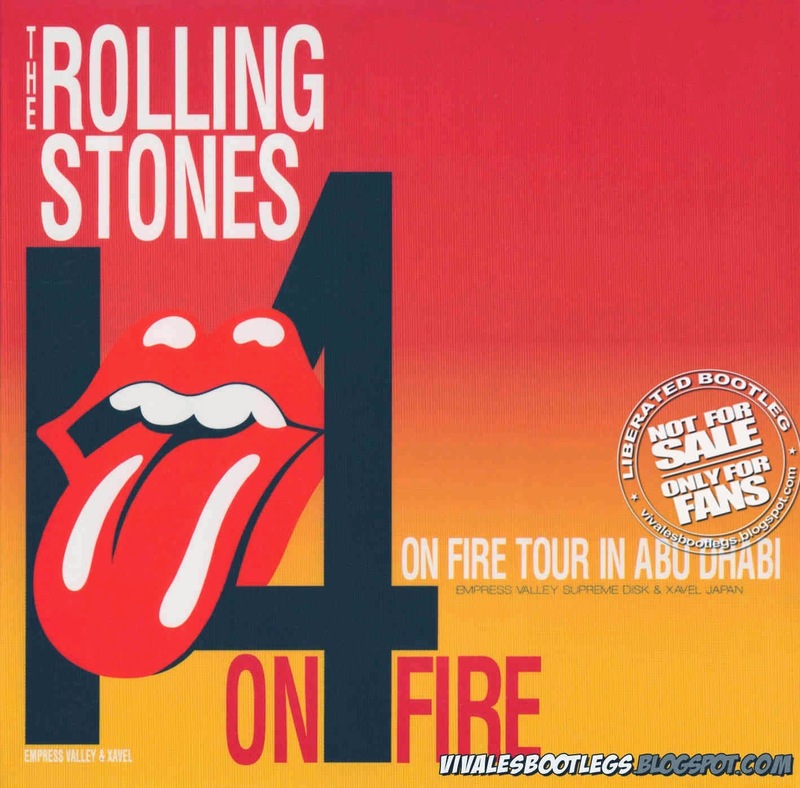 The Rolling Stones: On Fire Tour In Abu Dhabi. Recorded Live at Du Arena Yas Island , Abu Dhabi , United Arabian Emirates - Feb. 21, 2014 . Excellent+ Audience Recording :: Silver CDs :: MP3 CBR 320 kbps & FLAC. Files: 21.:: Size: 284.29 MB (mp3)| 857 MB (flac). Personnel: Mick Jagger: lead vocals, guitar, harmonica :: Keith Richards: guitars, vocals :: Ronnie Wood: guitars :: Charlie Watts: drums. Additional musicians: Darryl Jones: bass guitar, backing vocals :: Lisa Fischer: backing vocals :: Mick Taylor: guitars, backing vocals (all shows in 2014) :: Bobby Keys: saxophone :: Tim Ries: saxophone, organ :: Chuck Leavell: keyboards, backing vocals, percussion :: Bernard Fowler: backing vocals, percussion . 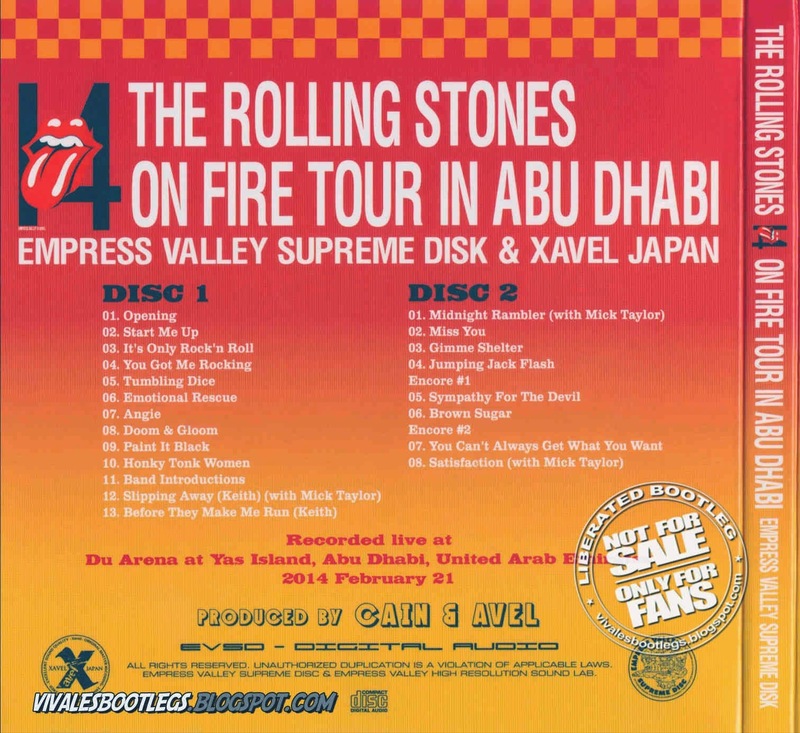 Notes: In the 50-plus year lifespan of The Rolling Stones, the seven months that passed between the band’s Middle Eastern debut in Abu Dhabi and their last appearance on stage in London’s Hyde Park, is fractional. But conceptually, that half-year is seismic – many thought the Stones’ historic outdoor gigs in London and Glastonbury were the perfect and fitting swansong for the most celebrated dinosaurs of rock n’ roll. But no – they raged on (‘52 & Counting’…? ), into Asia and Australia on the clumsily dubbed 14 On Fire tour. Since those Hyde Park gigs both Mick and Keith have both turned 70 – can they really keep it up for another run? On the basis of opening night at Yas Island’s du Arena – it’s a resounding yes. The Rolling Stones played an incredible two-hour set, brimming with bluster, groove, spirit, hits, history – and most surprisingly – seeming enthusiasm. Mick Jagger repeatedly made attempts to drop Arabic into his between-song banter, told us with a grin how the band spent their four days in the capital (visits to Emirates Palace, Ferrari World and Abu Dhabi Falcon Hospital) and hilariously recited the UAE’s emirates (only Ajman excluded) - 'did I leave anyone out?' - cheekily building up to Dubai. The seven month gap also may have given the band time to make peace with their largely-overlooked ’80s and ’90s output. Where Hyde Park’s setlist featured nothing younger than ‘Start Me Up’ (1981), aside from token reunion single ‘Doom and Gloom’, fans will be thrilled to hear about the inclusion of ‘You Got Me Rocking’ (1994) and ‘Slipping Away’ (1989) on the Abu Dhabi set. (read the full concert review >> HERE <<)..